The Rivers State Chapter of the Peoples Democratic Party, PDP, says any attempt by anybody to open up a parallel secretariat in the state in the name of the new PDP other than the existing legitimate ruling Peoples Democratic Party, led by its national and state chairmen, Alhaji Bamanga Tukur and Hon Felix Obuah respectively is criminal, provocative and an affront with no other aim than to cause chaos, and breakdown of law and order in the state. 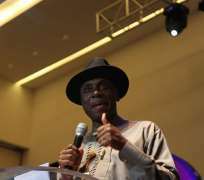 The party in a statement issued and signed by the Special Adviser on Media to the state chairman, Jerry Needam gave the warning against the moves by Governor Chibuike Rotimi Amaechi to open up a state secretariat for the new PDP at No. 38 Forces Avenue, Old GRA, Port Harcourt. The statement further warned that any such move not only amounts to an outright disregard for the rule of law, but is also aimed at truncating the nation's democracy, stressing that there is a subsisting Federal High Court order barring any attempt to impersonate and, or float any other political party in the name of the PDP which must not be abused. 'We'll however not let this be, but nonetheless, there is need to sensitize the entire Rivers people to be alert to such plot, regretting that Gov Amaechi should strategically choose to hatch the plot same time and day President Goodluck Jonathan made a stopover in Port Harcourt enroute Yenagoa, the Bayelsa State Capital. This is most embarrassing, insulting and satanically arrogant of a leader on a mission to destroy the system instead of going down alone. It's intolerable and unfathomable by any person or group of persons conscious of their identity and personality as typified by the Godfearing and self-respecting Rivers people. We are therefore calling on all to resist this arrant madness and animalism of one man desperate and power drunk', the PDP declared. The Rivers PDP wishes to reaffirm its faith and unalloyed support for one united PDP with Alhaji Bamanga Tukur as its chairman and President Goodluck Jonathan, the national leader.